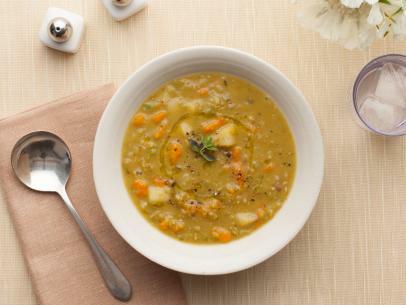 Nothing beats the winter chill like a steaming bowl of soup. Try these three tried-and-tested recipes from the Buckhorn Inn Kitchen. In a medium saucepan, melt butter and saute the onions, leeks, garlic and carrots over medium heat until vegetables are tender. Add bay leaf, sweet potatoes, Russet potatoes, wine, chicken stock and water. Simmer, covered, for 20 minutes, or until potatoes are tender. Discard bay leaf. In a blender, puree the cooked ingredients in batches until smooth. Transfer pureed portions to a medium saucepan. Season with salt and pepper. If the soup needs thinning, add more chicken stock. 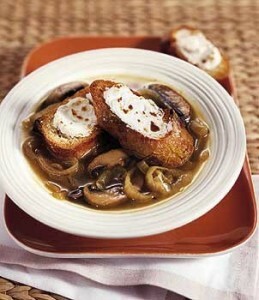 To serve, ladle into soup bowls and top with a dollop of sour cream and the buttered pecans. Slowly melt butter in a skillet. Add pecans and salt. Cook over moderate heat. Stir occasionally for 10 minutes or until golden brown. Transfer nuts to a paper towel and drain. Melt 1 tablespoon butter in heavy large pot over high heat. Add onions and thyme. Sauté until onions begin to soften, about 8 minutes. Reduce heat to low and cook until onions are caramelized, stirring occasionally, about 20 minutes. Transfer onion mixture to medium bowl. Melt remaining 2 tablespoons butter in same pot over medium-high heat. Add mush-rooms. Sauté until soft, about 12 minutes. Add cognac and garlic and stir 20 seconds. Stir in onion mixture, then broth and wine. Bring to boil. Reduce heat to low and simmer until onions are very tender. Salt and pepper to taste. Preheat broiler. Place bread slices on large baking sheet. Spread goat cheese on bread slices, dividing equally. Broil goat cheese croutons until cheese begins to brown in spots, about 30 seconds. Divide soup among 6 bowls. Top with croutons and serve. 1. Prepare the leek by cutting away the green top and the root. You’ll use only the white portion. Slice the white stalk down its length and rinse it under cold running water to wash away any sand. Pat the leek dry with paper towels and slice it thin. 2. In a 6-quart pot, melt the 4 tablespoons of butter over medium-high heat. Stir in the leeks, carrots, onions, and meat, and salt and pepper. Sauté until the onions begin to brown. Then stir in the potatoes, split peas, cloves, 1 teaspoon allspice, the ginger, thyme, garlic, broth, and water. There should be enough liquid to cover the peas and vegetables by an inch. Add more water if necessary. 3. Simmer the soup, partially covered, 30 minutes, or until the split peas are almost dissolved and the potatoes are tender. 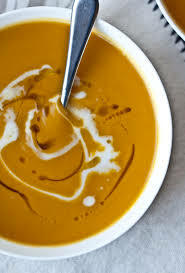 Taste the soup for seasoning, and just before serving it, swirl in the 2 tablespoons of butter. Finish the soup by stirring in the last 1/4 teaspoon of allspice.